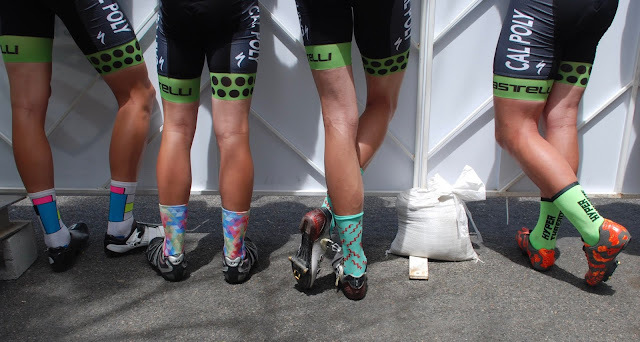 Bold legs, bold socks. Photo: the Dustin. At the beginning of May, a limited posse from Cal Poly Cycling rallied to Grand Junction, Colorado, for collegiate road national championships. As an experience, this road trip was one to remember. From the tireless drives, to the rest-stop snoozes, to the max-effort racing, this was one for the books. On Sunday, at collegiate national championships, a criterium in downtown Grand Junction took place. While not an ideal race for Cal Poly Cycling, it was a blast to mix it up. After the race, while assembled at the finish-line barriers, Dustin Stiffler snapped this shot of Sean Bird, Brad Wiggs, Colin Patterson, and Reed Williams. All weekend, at least our sock game was on point. This week, Everjourney will be dropping custom socks online. Be sure to follow along for additional details.